WHAT FONT DO I WANT TO USE ON MY SIGN? One problem that I don’t think has ever really been solved for a graphic designer or Sign Company is an easy way to find the right font for a job. How often have you known what you are looking for, maybe something fun, maybe a modern font, but the task of finding that right font is tedious. You end up spending so much time trying to find that perfect elusive font that it leaves you less time for the rest of the design. Sometimes with lack of time or budget you just reach for the trusty old favorite, when the right font could have really added “personality” to a design. For ages I have meant to organize my fonts by style, but a new job always arrives and I put it on the back burner. Free font sites such as DaFont, in my opinion, make it far easier to search for a font by style category than some of the commercial ones and are great for headings and sometimes logos. I am always wary of using free fonts for body copy as the kerning is not always great and they do not always include a full set of characters. Use simple block fonts when creating signs that need to be readable from a distance. A more stylish font may be harder to read and required to be set at a larger size. You should never set a script or cursive font in all capitals, the results will be very hard to read. Try to avoid using a heavy or fancy headline font for large passages of text. Use fancy lettering where type needs to draw attention to itself, such as a logo or a headline. Try to use more conservative looking type where items need to be subdued or merely listed, such as large areas of text, sub-headlines and items in a list. Signs Los Angeles | How to pick the perfect Font for your Sign? "What is the perfect font for your sign?" Since you asked there is really no answer to this question. It's a question we get a lot at The Sign Studio. Truly a question like that has to be answered on a case by case basis. It's like asking what is the perfect color for the outside of my house? The simple answer is white walls and black trim and shutters. There are no simple answers in life. Can you imagine driving through a neighborhood where all of the houses were decorated with white walls and black trim and shutters? Creepy right? Now imagine that only one of those houses in that neighborhood was painted a nice tan with beige trim and a red door. That house would really stand out next to all the other houses. That's what you are looking for in a font a way to stand out amongst all the other black and white houses. More importantly you need to find a way to stand out and get your message across concisely and as quick as possible about who you are and what you do. You only have the viewers attention for a very small amount of time before the next shiny thing grabs their attention. Here are two things that I think help when trying to consider what font to use. What am I trying to say? Who am I trying to reach? What is the History of Popular Fonts Used for Signs? It’s a question that The Sign Studio team members face frequently. While there is no one perfect answer for every situation, there are some fonts that have endured through the years to become staples in visual communications, DIN 1451, Frutiger, Gill Sans and Helvetica are classic fonts that have helped countless people reach their destinations throughout the decades. DIN 1451 isn’t a promising name for a good communicator, but it has been used since the 1930s for scientific and traffic signs. The name is an acronym for the German Deutsches Institut für Normung (German Institute for Standardization). In 1936 the German Standard Committee named DIN 1451 the official typeface for technology, administration, engineering, traffic and business. The medium version of this font was popular with graphic designers in the 1980’s and today it is frequently used for identification on vehicles and as cast metal lettering for street and building signage. Frutiger is a typeface commissioned in 1968 by the Charles De Gaulle International Airport for new directional signs. Type designer Adrian Frutiger was told to create a modern font that had excellent visibility at various angles, sizes and distances. This highly legible font with a warm personality is a favorite in the advertising industry. In 2008 it was the fifth best-selling typeface of the Linotype foundry. It is used throughout the public transit network in Norway since the 1980s. In 1929 Eric Gill was commissioned to produce Gill Sans for the London and North Eastern Railway (LNER). It was first presented in a single uppercase weight and became very popular immediately. It was the standard typeface for all LNER posters, locomotive nameplates, station signage and even the menu on the dining cars. More recently, the BBC adopted Gill Sans for its corporate typeface in 1997. 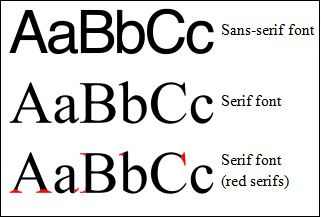 The British Government formally adopted Gill Sans as its standard typeface for use in all communications and logos in 2003. Helvetica is another classic font, so popular it even inspired its own film. The U.S. Government uses Helvetica for everything from federal tax forms to NASA’s Space Shuttle orbiter. It is also used for the U.S. television rating system. Helvetica was adopted as the official font for all of New York City’s Metropolitan Transportation Authority in 1989. The Chicago Transit Authority uses Helvetica for the city’s elevated train system and Philadelphia’s SEPTA uses it exclusively for all signage. To learn more about the history of classic fonts, visit this excellent post from the Live Well Collaborative. Signs Los Angeles | What Font Do I Want For My Sign or Banner? Use simple block fonts when creating signs that need to be readable from a distance. A more stylish font may be harder to read and required to be set at a larger size. You should never set a script or cursive font in all capitals, the results will be very hard to read. Avoid using a heavy or fancy headline font for large passages of text. Use fancy lettering where type needs to draw attention to itself, such as a logo or a headline. Use more conservative looking type where items need to be subdued or merely listed, such as large areas of text, sub-headlines and items in a list.